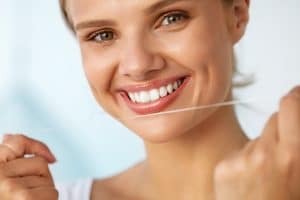 Is Good Hygiene Different with Dental Implants? Tooth loss comes with several concerns, the most immediate of which is addressing the reason behind your tooth loss (such as periodontal disease) and replacing the tooth with the right prosthesis. As the only prosthetic option for replacing lost teeth roots, dental implants are often the preferable option. Besides offering unmatched support for your prosthetic crown, bridge, or denture, implants also help you preserve a maximum amount of your healthy teeth and oral structures. Because they closely mimic your natural teeth, implants also offer the benefit of easy, effective maintenance without having to change your daily hygiene routine. A dental implant is a small post designed to mimic your tooth root in several ways. When strategically placed in your jawbone, the post can withstand a high amount of bite pressure, which also stimulates your jawbone the way natural teeth roots do. Each implant post is connected to an abutment that protrudes above the gum line and allows your dentist to secure a lifelike crown, bridge, or denture. Unlike a traditional bridge or denture, an implant-supported restoration is the closest replica of your healthy, natural teeth and the roots that support them. By providing a lifelike anchor for your dental prosthesis, implants avoid the need for external support systems like clasps, adhesives, or crowns bonded to healthy teeth. This means your replacement teeth are significantly more comfortable, and caring for them doesn’t require removing your prosthesis or using specialized cleaning equipment to work around it. Like natural teeth, caring for implants is as simple as brushing and flossing your teeth and restoration at least twice a day, and visiting your dentist routinely for preventive checkups and cleanings. One of the most significant benefits of dental implants is that caring for them is as simple and effective as caring for your natural smile. To learn more, schedule a consultation with Dr. Kania by calling her periodontal office in Encinitas/San Diego, CA, at (760) 642-0711.